Set in the near future, THE LINE chronicles the adventures of fifteen year old Rachel Quillen. Since her father died in a war, Rachel and her mother, Vivian, have lived in relative isolation on a place called The Property; the home of Ms. Moore, a taciturn woman who makes her living growing orchids. She hired Rachel’s mother as a housekeeper, even though she sensed Vivian was in some sort of trouble. Ms. Moore couldn’t be too picky, for there are reasons that good help is hard to find when you live too near the Line. Part of the National Border Defense System, the Line is an impenetrable barrier intended to protect the Unified States from invasion. Because of an impending attack, construction of the System had to be rushed, and the last section-called the Line-was built inside the U.S. border. When it was hastily activated, it created a permanent division between those lucky enough to be on the U.S. side and those who were not. Families were ripped apart, lovers separated. The territory left unprotected became known as Away; the abandoned unfortunates who survived the enemy attack became the Others. Over the years frightening stories circulated about the Others, stories about strange abilities and evil intentions. The Line became a place to avoid. For Rachel, the activation of the Line is just a history lesson; it happened long before she was born. Life on The Property has been good, if rather dull, and the Line is just something that has always been there. But things are about to change in ways she never imagined and suddenly the world outside The Property-a world of government control and corruption, where people without power or influence have few choices-begins to intrude. Smiled. A lot. And smiled some more. It still feels unofficial. Though I know it is official in my brain somewhere, I still have revisions to get through. I am looking forward to them, but I don’t think anything will feel official until I see my book in a book store. Wrote book. Submitted queries. Got agent. Got offer. That’s it so far in a nut shell. Seriously though, I did not think about trying to get published until a former teacher/friend of mine, who had had a novel published, suggested I should turn a thing I was writing into a novel. Then, once I had the novel, I thought “Why not?” Thanks are due to that former teacher/friend! I really am a disappointment in this area. I never really thought anything would come of my queries, so I never really had heart-breaking moments over rejection. Sometimes I would get discouraged, but I have a great friend who always told me “They are the ones who are missing out! The book is great!” So whenever I felt blue I would listen to her. Friends like that are gold. I worry about deadlines. I worry that I can revise successfully. But really, I don’t worry much about anything. I have always written for my own enjoyment and getting published seems like a (huge, stupefying) bonus. One should never, ever worry about bonuses. Big question mark for me–still waiting on notes. I expect it to be fun and difficult. I don’t have a typical day. Some days I don’t write. Some days regular life is too demanding. Some days I think about what I will write. Some days I write a lot. Most days that I do write I find it difficult but satisfying. A big Ah-ha for me was that I can make it the way I want it to be. What happens next? I get to decide! Wow! What is one of the biggest myths in children’s book publishing that you wish aspiring writers would just forget about? That if you get published you are somehow rich and famous and “better.” I truly think getting published is a combination of good writing, luck and perseverance. If your goal is to write, then write. If you get lucky, don’t behave differently because of it. Thank your lucky stars and spread the joy! The composer Stravinsky had written a new piece with a difficult violin passage,” writes Thomas Powers, quoted in the book Sunbeams. “After it had been in rehearsal for several weeks, the solo violinist came to Stravinsky and said he was sorry, he had tried his best, the passage was too difficult, no violinist could play it. Stravinsky said, ‘I understand that. What I am after is the sound of someone trying to play it. '” I love this. You can never achieve perfection. The attempt to create something meaningful is all that matters for most of us. Keep writing. Be realistic about how writing can change your life. The big ways it changes it are by adding meaning (for you, certainly, and hopefully for readers) and by allowing you an outlet for your thoughts and feelings. It isn’t about status, or money, or fame. Aside from WRITING FOR CHILDREN AND TEENS<—shameless plug, are there any other books on craft you recommend? I am guilty of not reading books on craft. I try to write what I would like to read, and for me that is clean, well-paced, interesting stuff, where I care about the characters and the story, and where I get more than the sum of the parts from my reading experience. I love the feeling I get when I have read something that leaves me thinking about larger themes. Finally, Snoop wants to know: So, what’s up with the cats? What? I only have three. It takes more than three to get categorized, doesn’t it? This concludes our interview with our latest author Teri Hall. 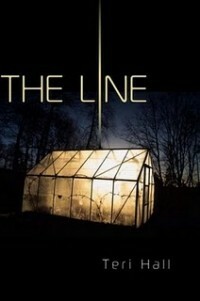 We wish her much success with her debut novel THE LINE. A Special Free-tique Round is Open: TAG, You’re it! Thanks so much for covering The Line! The publisher is actually Dial Books for Young Readers. There was a switch when my editor changed houses. This goes along with something I’ve been thinking about, that no matter how hard it is to submit and face rejection, it is so much better than giving up and surrendering to a quiet, vanilla life. Writing is about adding meaning — it is the goal, in and of itself.